As a home school mama the idea of teaching everything can be totally and completely overwhelming. I get it. What if I told you that I could help you make art one of the most looked forward to, joyful parts of your day? As a former public school art teacher and current home school mom to four I want to share what I’ve learned with you about how to make art enjoyable, affordable, and do-able for your family. 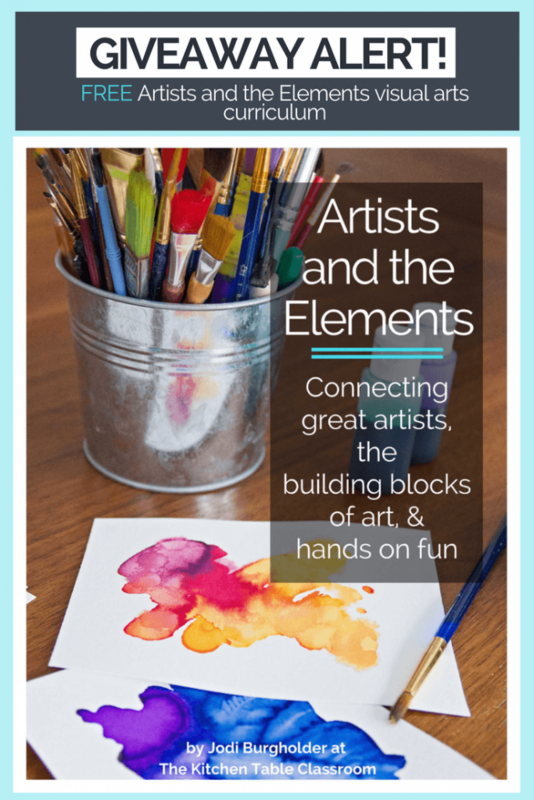 The Artists and the Elements…..
Artists and the Elements is an almost 100 page visual arts curriculum in a digital e-book format that I wrote with the home school mom in mind. The seven elements of art are the backbone of the program. Each of the seven elements are broken down to make teaching easy. Art doesn’t have to be serious and take intense instruction. For each of the seven of elements of art there is a “play” section. 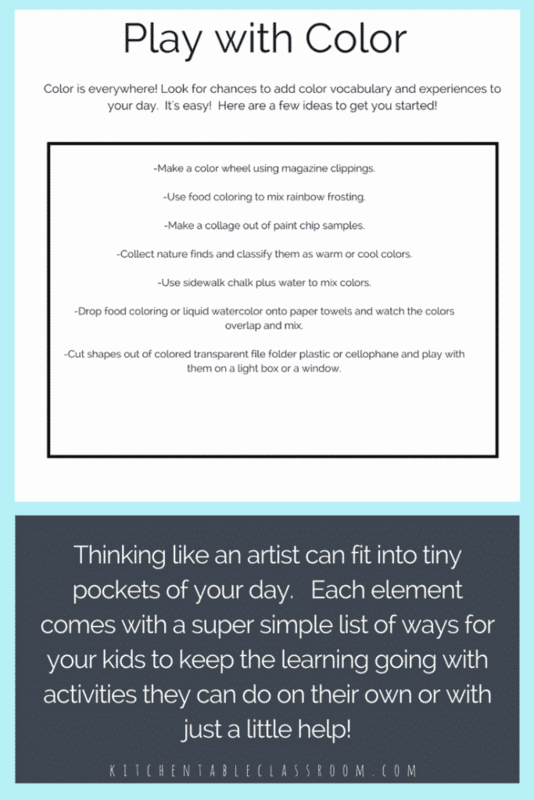 These are easy ways to include a little creativity on those days when you might only have a few minutes. Give them a few materials and a big idea and get outta’ the way while they make! 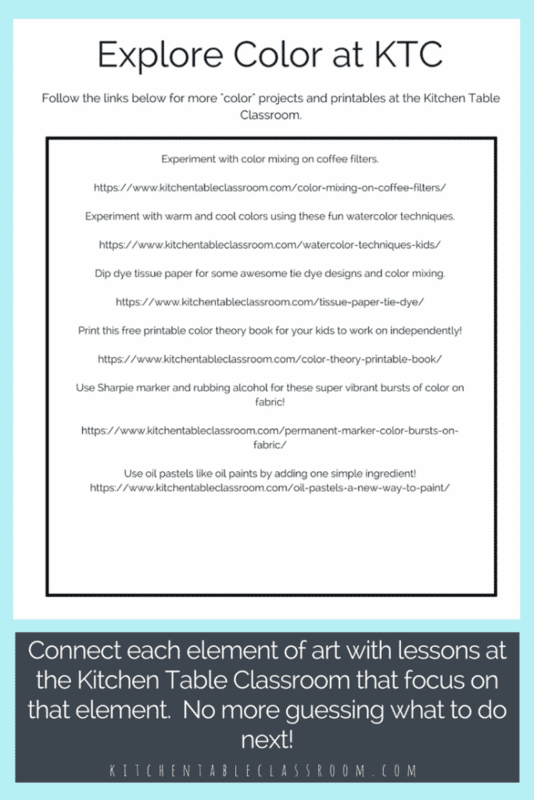 If you love the 100+ free lessons at the Kitchen Table Classroom this section will help you know how to best use those lessons and relate them to each element. No more deciding what comes next. Each of the seven elements has a printable that spells out basic definitions and concepts. 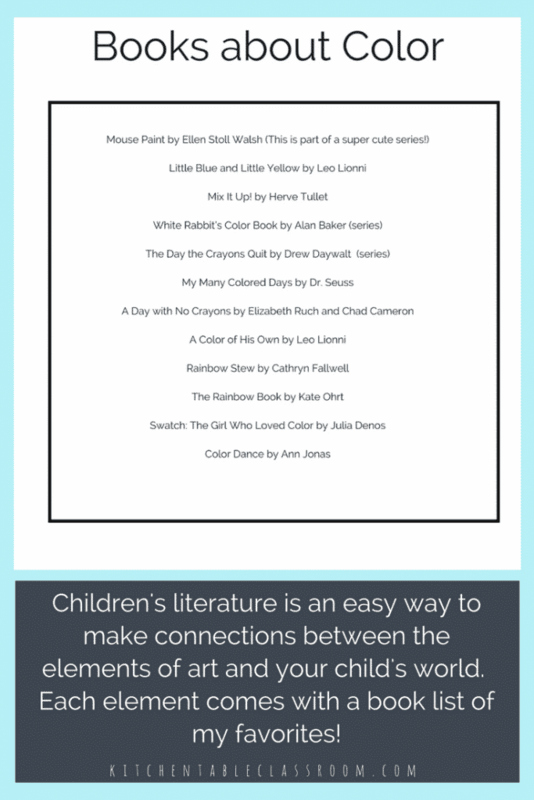 These printables can serve as a reference for a journal or sketchbook as they also have a place for your student to demonstrate the concept learned. Children’s books are such a fun way to relate art concepts to your child’s world. I’ve done the leg work for you. Each element comes with a book list so you can have books ready to grab when you have a few minutes to curl up and read. The lowdown on the artists…. Each of the seven elements is paired with an artist whose work prominently displays that element. Artists and the Elements provides information on each artist so that you can confidently introduce the artist to your young artist. 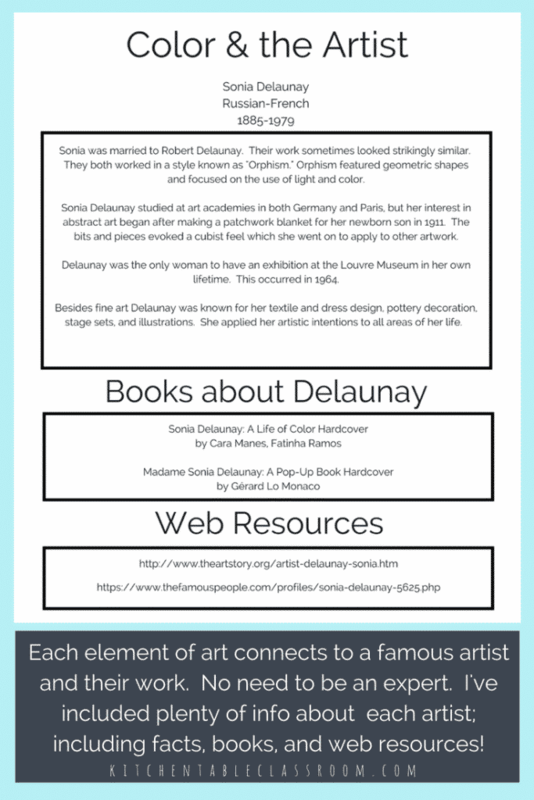 Each unit includes a printable resource all about the featured artist. These are meant to be used by the student. Feel free to write or just use them as a jumping off point to chat about the artwork and the artist. In addition to the activities above each of the seven units focuses on a featured project inspired by the artist studied in that unit. These are in depth projects that will take several sittings to complete. I supply prompts to help you know how to help your student along the way and even modify the project to suit different ages or abilities! One of my favorite things about this curriculum is that the supply list to do ALL of the featured projects can be purchased at any big box store for under $25. And… these same supplies can serve multiple kids. In addition to Artists and the Elements I’ve written an e-book titled Art Experiences Outdoors. 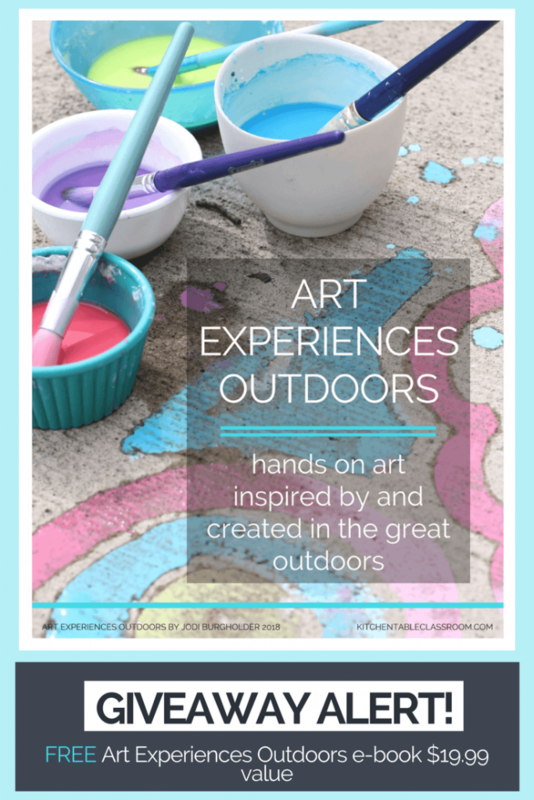 It’s full of 24 big ideas to get your kiddo outside and making! This e-book is a $19.99 value and guess what… I’m giving away a free copy of this book away too! And just to add a little more sweetness…..
I’ll also be throwing in a copy of my digital bundles The Elements Illustrated and The Principles Illustrated. These bundles are huge with all kinds of printable resources from posters, to printable books, to crosswords, and so much more! For a limited time only you can access the Artists and the Elements “Color” unit for free. Be sure to visit the Kitchen Table Classroom and use the turquoise subscribe button in the sidebar to become a subscriber to my weekly newsletter. Upon subscribing and confirming your subscription you will receive a subscriber only password that will allow you access to my Resource Library. 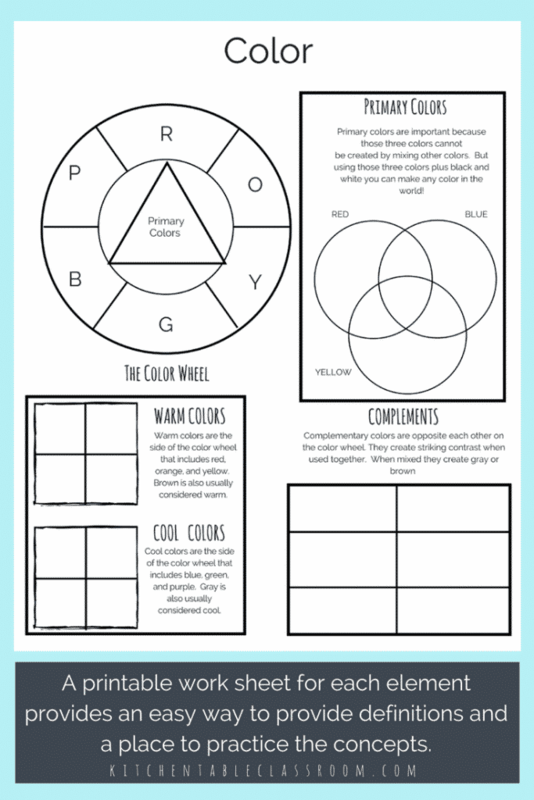 You will find the “color” unit of the Artists and the Elements there for a limited time only, along with dozens of other free printable resources! To enter to win this HUGE visual art curriculum bundle, simply use the Rafflecopter form below. All entries will be verified. Open to US residents only. The giveaway will close on 8/5/18 at 11:59pm EST. The winner will be announced via email the following day! Good luck! My kids love art, so this would be helpful. My children love art and we starting our homeschooling journey this month. We’ll begin our first year of homeschooling this fall with my kindergartener and we are so excited! She is super interested in art and we would love to have a curriculum to help! Our student loves art a favorite subject ! This curriculum looks great! I think my daughter would love it. I hadn’t really thought about an art curriculum yet. I have a painter and this curriculum looks like a good way to expand her exposure to different types of art! This looks like a fantastic curriculum!! I would love to use it with my students! My children LOVE art and I have ZERO art abilities! 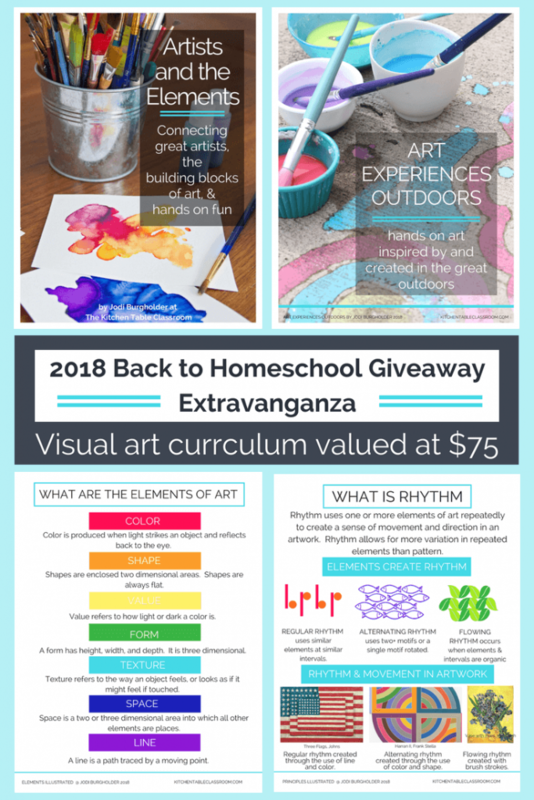 I would love to teach them more but I have no idea how or where to start so winning this amazing giveaway would help me on the right path in teaching my kids about art. My kids and I all love art. This would be wonderful for our classroom. I love to share art with my kids. This is so fun! My daughter LOVES art, and my son is just starting to show some interest at last. Even though I studied art myself, I need something to help me bring it into our school days! This curriculum looks amazing! 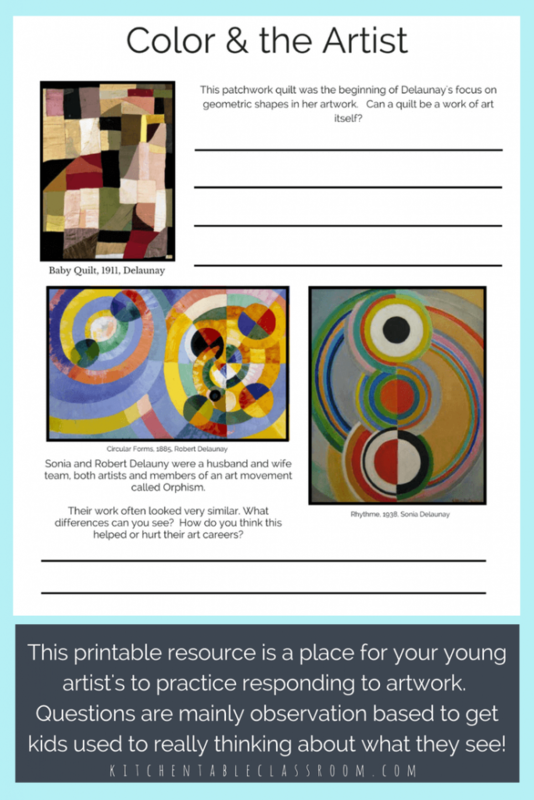 What a great tool to help kids learn about art and love it even more! I would to win these books. If I don’t, I fully intend to purchase them. Looking for something to try for art. This will be my first year of homeschooling and my oldest loves art so much! I was a Science student. I didn’t spend much time studying about Art and I am very weak at this subject. I think this curriculum will be helpful for me to guide my children. I know nothing about art so I’m pulling together resources to put art in our morning time and this would be a wonderful addition. My 13yo loves art and I would love to expand her artistic horizons. This looks like a fun but not intensive art curriculum. I think my fifth grader would love it. Thanks for offering the giveaway. Need an art curriculum for my busy peeps. I love art…I love it more when I have help teaching it to my kids!! This program looks great – and would fit a wide range of ages! I have several kiddos that really enjoy art so this would be a great addition. I’m teaching Art in our co-op this year. Winning this would be a great help! 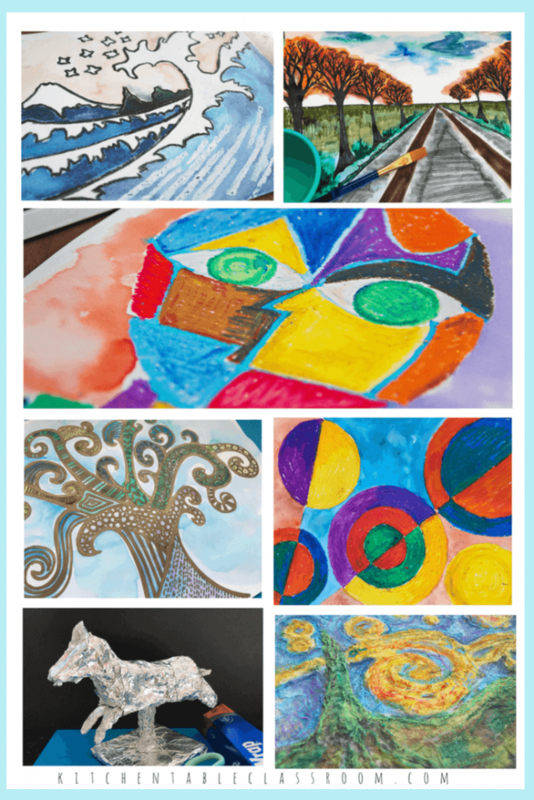 I have been looking for an art curriculum for my children, and this looks great! What a wonderful giveaway. I know 5 kids who would love to win this. All artists,all hungry for knowledge!